The Trump administration’s trade and immigration policies have attracted significant attention, but the current US administration’s environmental policy shifts also pose the potential for significant impacts on global markets, particularly in the energy sector. Under the Obama administration, for example, the executive branch often opposed or heavily restricted energy projects on the basis of environmental concerns ranging from alleged impacts of unconventional oil and gas production (e.g., hydraulic fracturing, or “fracking”) to asserted climate impacts of fossil fuel combustion for electric power generation—both domestically and in overseas markets, such as China. Continue Reading US-Mexico Energy & Environmental Policy Transition: Opportunity Amidst Uncertainty? Last week the Federal Energy Regulatory Commission (FERC) made some headway in how it evaluates greenhouse gas (GHG) emissions from natural gas-related projects. In recent FERC pipeline certification proceedings, the two Democrats on the Commission have been critical of how FERC addresses a project’s potential GHG emissions and climate change impacts. With only four active commissioners, this dispute has made it difficult to obtain the majority needed for FERC approval. In last week’s order, however, the two Republicans were joined by Commissioner Cheryl LaFleur, a vocal critic of the Commission’s approach, in authorizing a new liquefied natural gas (LNG) export terminal and associated natural gas pipeline in Louisiana. The commissioners were able to persuade LaFleur to issue a concurring opinion by expanding the environmental analysis of GHG emissions. This suggests that FERC’s commissioners may have found some new common ground that could serve as a model for the evaluation of future projects. The project at issue involved the construction and operation of an LNG export terminal and associated facilities along the Calcasieu Ship Channel in Cameron Parish, Louisiana. FERC’s National Environmental Policy Act (NEPA) analysis evaluated the annual direct GHG emissions from the terminal’s construction and operation and compared them to national GHG emissions data compiled by the US Environmental Protection Agency (EPA). According to this analysis, the project would emit nearly 4 million tons of GHGs annually, potentially increasing national CO2 emissions by 0.07 percent. Due to the pending repeal of EPA’s Clean Power Plan and the pending withdrawal from the Paris climate accord, FERC noted that there are currently no national emissions targets to use as a benchmark for the project. The environmental analysis acknowledged that the construction and operation of the project would contribute incrementally to climate change, but concluded that FERC could not determine whether such a contribution would be significant. 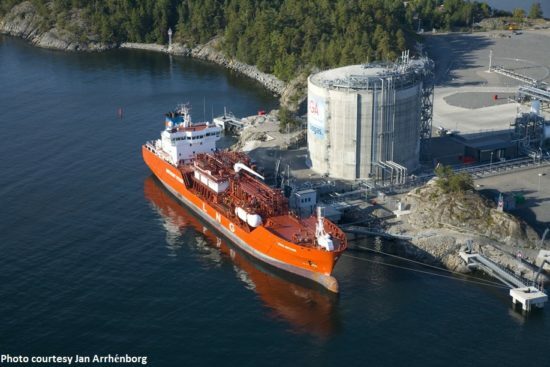 Ultimately, because it found that the project would be in the public interest, FERC approved the LNG terminal. Commissioner LaFleur’s concurring opinion first notes the Natural Gas Act (NGA) provides the US Department of Energy (DOE) with exclusive authority over the export of natural gas, including the responsibility to consider whether the exportation is in the public interest. In terms of its environmental review, Commissioner LaFleur states that DOE, rather than FERC, has the responsibility to assess indirect impacts of LNG exports, but FERC must still satisfy its obligations under NEPA. Within that context, LaFleur expressed her appreciation for disclosing the direct GHG emissions of the project and for comparing them to national levels. Yet, she was critical of the Commission for not making a significance determination, stating “The magnitude of the direct GHG emissions from the Calcasieu Pass Project certainly appear to be significant, as contemplated by NEPA [but] the Commission has not identified a framework for making a significance determination.” LaFleur called on FERC to use the Social Cost of Carbon, which assigns a dollar amount to each ton of CO2 emissions, to assess the significance of the climate change impacts. Thus, while Commissioner LaFleur ultimately approved the project, she did so recognizing that FERC’s LNG export responsibilities are different than its responsibilities for pipelines and encouraged the Commission to adopt a framework to make a significance determination. Commissioner Richard Glick was the lone dissenter. He repeated his past arguments that the Commission’s public interest determination must include an assessment of a project’s impact on climate change. “Neither the NGA nor NEPA permit the Commission to assume away the climate change implications of constructing and operating an LNG facility.” While Glick found that quantifying the project’s GHG emissions is a “necessary step” toward meeting FERC’s NEPA requirements, he argued that simply counting the volume of emissions is insufficient. Glick also echoed LaFleur’s recommendation to monetize the harms of climate change by using the Social Cost of Carbon, concluding that a rigorous examination of a project’s impacts on climate change would reduce the legal risk on appeal. FERC’s approach of calculating and disclosing potential GHG emissions and then comparing those totals to state, regional and/or national climate change goals may serve as a model for FERC’s environmental analysis going forward. For some interstate natural gas pipeline projects the DC Circuit has upheld a similar approach. For example, as recently as February 19, 2019, the DC Circuit dismissed claims that FERC failed to adequately consider the downstream climate impacts of the Mountain Valley Pipeline, noting that “FERC provided an estimate of the upper bound of emissions resulting from end-use combustion….” Given DOE’s substantial role in approving LNG terminals, however, it remains to be seen whether Commissioner LaFleur will concur with similar environmental analyses of GHG emissions in the context of interstate natural gas pipeline projects. 2018 was a banner year for M&A activity in the energy space, with numerous high dollar value transactions in the upstream, midstream, downstream and oil field services (OFS) segments. As investors in the public securities markets have shown a significantly decreased appetite for new issuances of equity by energy companies, the preferred exit or growth strategy for 2018 has been through strategic mergers, acquisitions or divestitures. These transactions have manifested themselves in various forms: asset acquisitions and divestitures, private equity investment into “drillcos” with strategic oil and gas companies, public-public mergers between OFS companies and upstream shale drillers, and simplification transactions by master limited partnerships (MLPs) in the midstream space. In addition to all this M&A activity, one element has become significantly more prevalent in the oil and gas industry throughout 2018 and shows no signs of letting down for 2019: water. Continue Reading Oil & Gas… & Water! Last week, EPA and the Corps issued a long-awaited proposal to redefine the “waters of the US” (WOTUS) subject to federal regulation and permitting requirements under the Clean Water Act. The reach of the CWA is notoriously unclear, but knowing which areas on your property are jurisdictional and will require permits is critical to project planning and timelines. If finalized, the proposed rule would replace the Obama administration’s contentious 2015 WOTUS Rule and eliminate the regulatory patchwork that currently exists as the 2015 WOTUS Rule is being implemented in only certain parts of the country. For more information, read the full post here on The Nickel Report. In recent litigation involving the development of interstate natural gas pipelines, one of the key issues has been whether the state has waived its authority under Clean Water Act (CWA) section 401 by exceeding the one-year time period. In a separate case involving a series of hydroelectric facilities, the waiver period was again directly at issue. On October 1, at oral argument before the U.S. Court of Appeals for the D.C. Circuit, the parties addressed whether California and Oregon had waived their water quality certification authority by having the applicant withdraw and resubmit its request for certification over a number of years. Notably, the judges seemed to agree that the Federal Energy Regulatory Commission (FERC) could make a waiver determination before the end of the one-year time limit and that withdrawing and resubmitting an application may not always restart the clock.